Tiles can be removed providing that are touching another tile the same colour on at least one edge. Removing small groups of tiles (2 or 3 together) provide very small scores, but by removing other tiles, it is possible to get very large groups of tiles of a single colour. Removing these large groups results in drastically higher scores. ...to learn how to write games for the Windows Mobile platform. ...as personally I think it is a more attractive, structured and enjoyable game than Bubble Breaker. Hopefully you will enjoy it too! 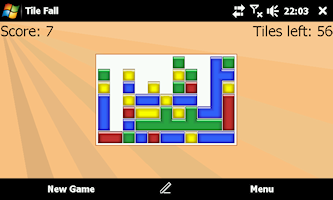 Windows Mobile Tile Fall is available to download now. Auto adjust screen orientation on supported devices (e.g., HTC Touch Diamond/Pro, Samsung omnia) -- turn the device on its side and Tile Fall will rotate its display to match. 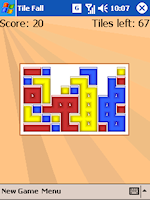 Tile Fall is freeware -- you may download and play it for free. Thanks to Koushik Dutta for the Sensors project which allows Tile Fall to automatically change its orientation when a supported device is rotated. Tile Fall for Windows The Windows version of Tile Fall. Tile Fall for Psion 5 devices The Psion EPOC version of Tile Fall. Tile Fall for Psion 3 devices The Psion SIBO version of Tile Fall. Tile Fall for Amiga The Amiga version of Tile Fall.